Pat Wolfe, EdD is a former K-12 teacher, county office administrator, and adjunct university professor. She is a native of Missouri, completed her undergraduate work in Oklahoma, and her postgraduate studies in California. She presently resides in Napa, California. 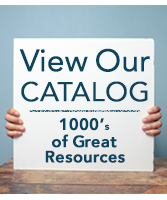 Over the past 25 years, as an educational consultant, Wolfe has conducted workshops for thousands of administrators, teachers, boards of education and parents in schools and districts throughout the United States and in over 50 countries internationally. 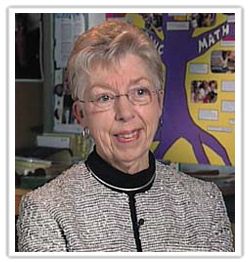 Her major area of expertise is the application of brain research to educational practice. 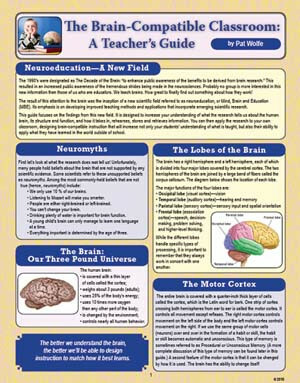 Her entertaining and interactive presentation style makes learning about the brain enjoyable as well as practical. She is an acclaimed author and has appeared on numerous videotape series, satellite broadcasts, radio shows, and television programs. 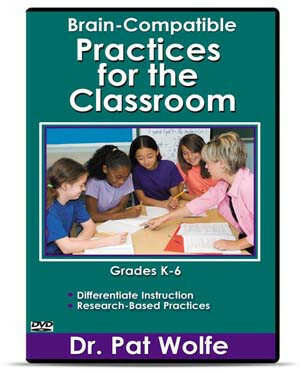 For National Professional Resources, Inc./Dude Publishing, she wrote the laminated reference guide, The Brain Compatible Classroom: A Teacher’s Guide, and has been featured in several professional development videos productions, including Brain-Compatible Practices for the Classroom (elementary school and special education versions).